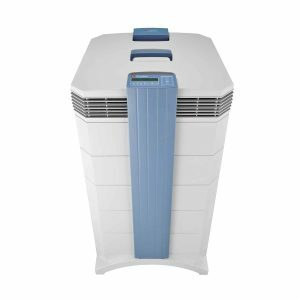 I’ve decided to review the GC Multigas air purifier, as I love the healthpro plus from IQ Air. This new air purifier from IQ-Air has a multi-layered filtration system, which is supposed to filter out numerous harmful compounds, such as VOCs, smoke, formaldehyde and other major pollutants. The unit seems to be suitable for numerous environments, including the home and office. 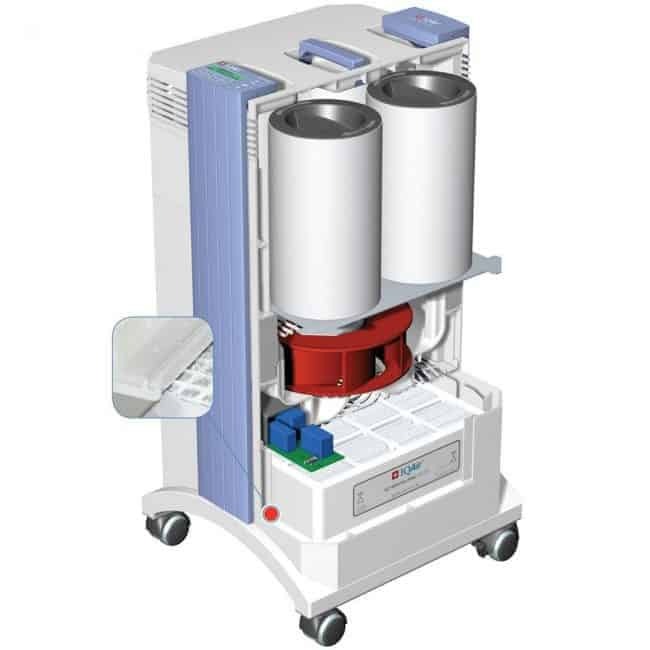 This purifier is designed for large areas up to 1,200 square feet, which coupled with its ability to deal with chemicals, makes it a reasonable choice for hospitals and laboratories. Let’s take a closer look at its functions to see if it’s worth the formidable amount of money the manufacturer is asking for it. The air purifier comes with a three-stage filtration system, which seems pretty impressive at the first glance. HyperHEPA Pre -filter – Deals with 99.97% of contaminants 0.3 microns in size. This filter can help eliminate mold spores, pet dander, and other small pollutants thus keeping your home or office air clean and fresh. This filter needs to be replaced at least once in 12 months. The replacement filter costs about $65. MultiGas Cartridges – Take care of a wide range of gases, odors, and chemicals. The VOCs are filtered through the chemical absorption. These cartridges should be replaced at least once in 2 years. The replacement cost is about $300. Post-filter Sleeves – This post-filter keeps the fine particles from escaping by wrapping the gas cartridges. This sleeve set can be replaced once every two to two and a half years, depending on the use frequency. The replacement cost of the sleeves is about $350. Replacing the filters only looks easy. In fact, it’s a complicated and time-consuming process. In order to get to the pre-filter, you need to remove several clamps and virtually take the whole air purifier apart. The process becomes more complex because you need to replace the pre-filter and the rest of the filters at different times. It’s important to closely follow the instructions when changing the filters. Otherwise, breakdowns are possible. When it comes to the filter replacement costs, they are high. You will need to spend about $350 to $390 per year on the filters. Considering that you can buy a new air purifier (from another manufacturer) for this price, it seems somewhat unreasonable. I appreciated the way this air purifier looks. It has a nice and straightforward design with an easy-to-use control panel. However, the unit is rather heavy. It weighs about 40 pounds making it almost impossible to move from one room to another on a regular basis. The model comes with optional caster wheels to simplify the relocation. At the same time, the unit is rather large. It’s dimensions are 16 x 15 x 28 inches. While these dimensions seem reasonable for a medical office or a laboratory, they seem a bit too much for a house. Since the manufacturer claims that the unit can clean the air in the rooms up to about 1,200 square feet, using it in a small room just doesn’t make sense. Perhaps some homeowners may try to install it in one room and hope it takes care of several if the doors are open. The majority of users prefer placing the unit in the kitchen. When it comes to smart options, the manufacturer failed to come up with many. In fact, the only real smart option here is the timer. You can set the timer for different periods of time on any weekday. This can improve the energy efficiency of your unit while keeping your air clean without your involvement. 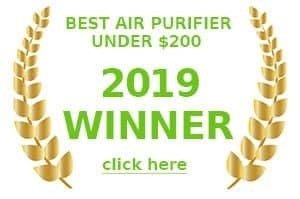 In fact, many users say that this air purifier emits a foul odor, which is often worse than the odors it should be removing. However, not everyone is sensitive to this odor. The air purifier doesn’t have sensors to measure air quality. That’s why it lacks an auto-mode. You have to evaluate the air contamination on your own and turn the purifier on according to a personal schedule. The air purifier comes with a remote control so you can change the settings without getting off your favorite couch. The lack of smart options is upsetting especially when you consider the high cost of the unit. The manufacturer claims that the air purifier can clean an area of about 1,200 square feet. However, I was unable to find the CADR ratings of the product. I have read numerous reviews and it seems as if the air purifier does a good job servicing large areas. However, some of the users have been complaining about the unit’s inability to deal with extreme chemical smells. But this parameter didn’t depend on the size of the room. 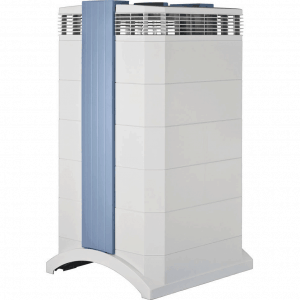 Overall, the air purifier can be used in rooms of around 1,000 – 1,200 square feet. Even though this is a large, medical-grade air purifier, it’s hardly noisy. The unit comes with a 6-speed fan. The noise on each of the settings varies from 25 dB to 69 dB. At the lowest setting, the air purifier is virtually silent. Its work is similar to the rustling of leaves. It can be an excellent choice for a bedroom. At the highest setting, the unit is loud. It may interfere with watching TV, working or reading a book. However, the highest setting is rarely necessary. You may need to run the unit on the 6th speed when you just purchase it to clean the facility or house. 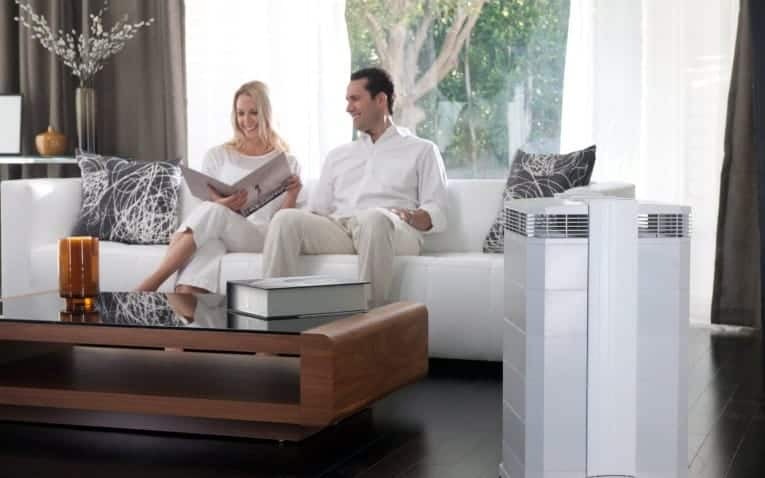 Once the air is clean, the air purifier can go into a “maintaining” mode, which doesn’t require high fan speeds. This air purifier has one of the most impressive warranties I have seen in the years of reviewing these units. It comes with a whopping 10-year warranty. However, it works only in North America. In order to take advantage of the warranty, you have to register on the manufacturer’s website. Timely filter replacement is important for the warranty to work. Make sure you use the unit according to the instructions. A 10-year warranty is a demonstration of the manufacturer’s assurance that the unit will serve flawlessly for at least 10 years. Overall, I’m not fully satisfied with this purifier. While it may be a good idea for commercial buildings, hospitals, medical offices, and such, I don’t see how it can be useful in a house. It’s large and heavy while unreasonably expensive. For the price you pay for this air purifier, you can purchase several high-quality units. I was also disturbed by the reviews of the odors it can cause. If such is the case with some of these models, they definitely aren’t worth the money. I can’t recommend this air purifier to homeowners. Meanwhile, hospitals and factories, which aren’t as sensitive to the cost, may appreciate it. For the price, you would expect the GC Multigas to be the best air purifier around, or at least be close to. I think it’s fair to say it falls a long way short of that. Too many issues for something that costs so much. You can find a far better machine for half the price. Enough said.